In 1990, Bobbi Brink was searching through a her local Texas newspaper for used restaurant equipment when another classified listing caught her eye and changed the course of her life. 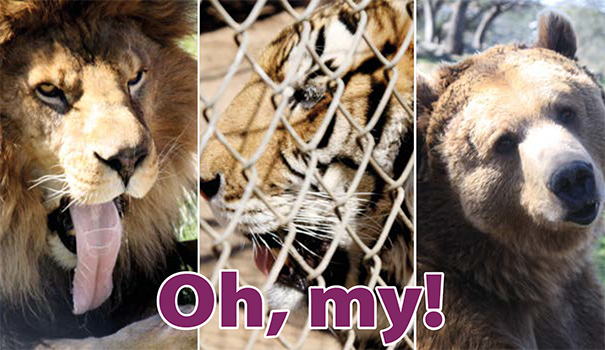 It was Brink’s first experience with the exotic animal trade and one that eventually led her to open one of the most respected wild animal sanctuaries in the country: Lions, Tigers and Bears located in the Alpine in eastern San Diego County. Brink has no formal training in zoo keeping or veterinarian work but she has been working hands-on with wild animals since 1990, starting with volunteering for that lady in Texas who bred big cats from her mobile home. “At first I had no clue, because I didn’t know what she was doing was wrong for like the first three months I was there — but then you quickly start seeing [abuse],” she said. For example, she said, breeders keep pairs in small enclosures. When the babies are born and their eyes open at eight days old, they yank them from the mother to bring the female back into heat. A tiger will breed every 105, 110 days this way but in the wild, they only breed once every two years. 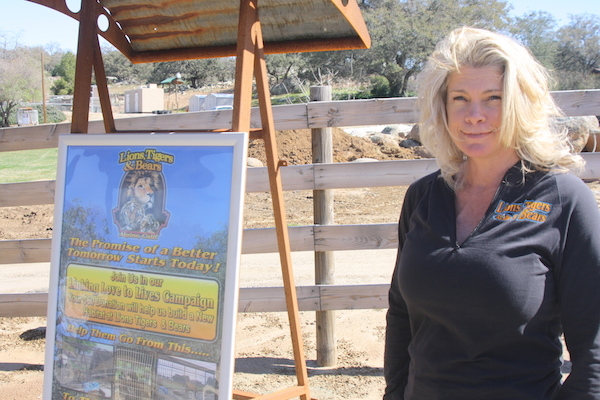 Lions, Tigers and Bears (LTB) was founded shortly after Bobbi and her husband Mark Brink bought the Alpine ranch in 2003. The first animals they brought there were two tigers named Raja and Natasha who were rescued from a Texas man who bought the cats as a birthday present for his wife. He never built them a proper habitat because the couple divorced. After several visits from authorities, the man told U.S. Fish and Wildlife that he was going to shoot the tigers but instead was convinced to give Brink 30 days to relocate them from his home in Texas to her new property in Alpine. Today, LTB is home to 60 animals, “every single one a rescue, a confiscation or surrender,” Brink said. 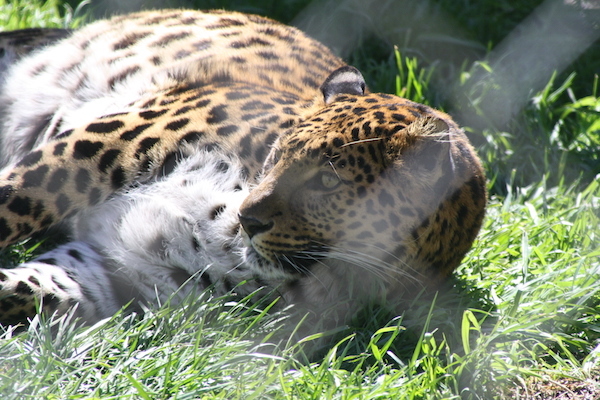 There are 17 different species, including African lions, cougars, white and orange tigers, bobcats, a serval Indian cat, black and spotted leopards, American and Himalayan black bears and grizzly bears. The sanctuary is also a rescue for horses, donkeys, miniature horses, sheep, goats and other farm animals. LTB is also one of the only sanctuaries in the country with a hauler that can transport these types of animals, so it is often called upon to help move animals for other sanctuaries. The cost of running the LTB is around $1.2 million a year with the greatest expenses being electricity, insurance and building new habitats. “The average to feed one tiger, just food and basic vaccines and flea control, is about $10,000 a year per animal,” Brink said. The budget is funded entirely by donations, educations programs, a two-bedroom house that is rented to animal lovers at $650 per night and various fundraisers. LTB is hosting a casino night-themed gala on May 20 that will feature gambling tables, a silent auction, bar, entertainment and, of course, the animals. The gala usually raises about four months’ worth of operating costs, Brink said. There is also a fundraiser at Christmas time and a “spooky” campout in the fall held at the ranch. Raising money is important right now because the sanctuary is in the middle of an ambitious expansion. The plan includes building more habitats, a feed room, an expanded vet facility and a classroom. Brink said that when completed, LTB will be able to hold 100 more animals. A habitat is currently under construction for three new cats coming in this year — one white lion and two lions that are retired circus animals. Although LTB is not a zoo where people walk up and buy tickets, visitors are welcome by appointment on Wednesdays through Saturdays at 10:30 a.m. and on Fridays and Saturdays at 1:30 p.m.
To make an appointment to visit the sanctuary, to schedule a field trip or other large group visit, or to make a donation, visit lionstigersandbears.org.